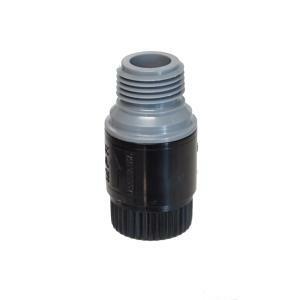 This small 1/2" NPT mini pressure regulator, by Hendrickson Bros, can be used to retrofit existing sprinkler heads to low volume, water saving, drip irrigation. Easy to install on a 1/2" riser or pipe thread fitting. This unit has a built in check valve which opens at 25 PSI then regulates the system to the pre-set pressure and closes at system shut down when pressure drops to 10 PSI. Always install pressure regulators downstream from all shut-off valves. Be sure to install pressure regulators in the proper direction. The arrow on the housing shows the direction of the flow and should always point downstream toward emitters.